Chuck Driesell’s career spans 30+ years of all ranks of Division I, Division III and high school basketball. A former ACC all-academic shooting guard and University of Maryland alumnus, Coach Driesell started his career at the Naval Academy Prep School where he amassed a 40-29 record from 1985-88. He spent nine seasons as Associate Head Coach at James Madison University under his father, Charles ‘Lefty’ Driesell. He helped build and guide the JMU Dukes to unprecedented success. From 1989-94, JMU either won or tied for five consecutive Colonial Athletic Association regular season championships (the only team in the country to do so at the time). JMU captured the 1994 CAA Tournament title and advanced to the NCAA Tournament where they lost to eventual national finalist Florida, 64-62. JMU compiled a 159-111 record (85-45 CAA) and made four postseason appearances in nine seasons. Driesell spent six seasons (1997-2003) as the Head Coach at Division III Marymount where he guided the Saints to an 88-72 mark. In 1999-2000, he led Marymount to the Capital Athletic Conference Tournament championship and its first NCAA Tournament appearance. 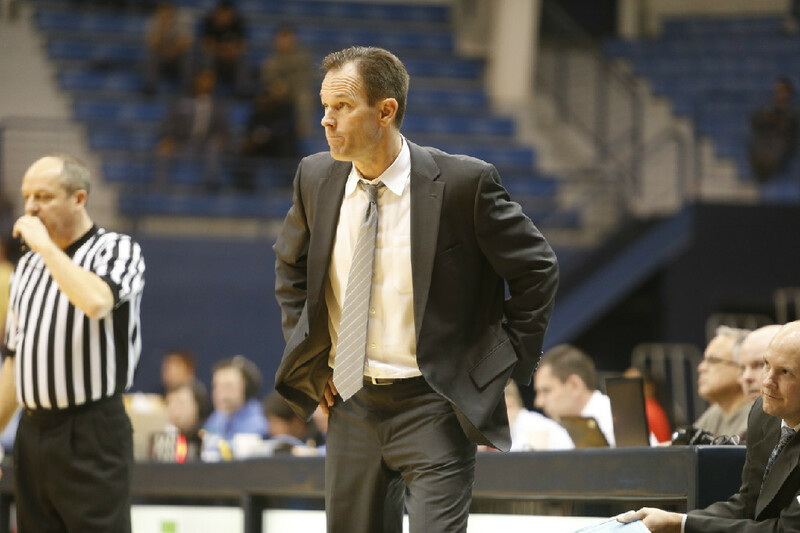 Driesell also served as Assistant Athletic Director at Marymount from 1999-2003. Driesell left Marymount to become an Assistant at Georgetown University where he was the Recruiting Coordinator that included the class of Roy Hibbert and Jeff Green; two standout players for the Hoyas. Driesell moved on to become the Head Coach at Bishop Ireton High School in Alexandria, VA before Gary Williams, Head Coach at The University of Maryland needed someone that knew and understood recruiting in the DMV area. 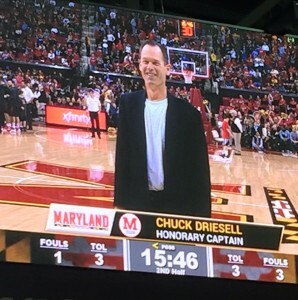 Driesell served for four seasons at the University of Maryland as an Assistant Basketball Coach where he went head-to-head in recruiting with schools from the ACC, SEC and Big East. His time at Maryland included a 24-9 record in 2009-10 and a share of the ACC regular season title with an 11-3 conference record. Maryland earned a berth in the NCAA tournament as a No. 4 seed and advanced to the second round of the NCAA tournament. Coach Driesell became the Head Coach at The Citadel in 2010. He spent five years coaching, recruiting and developing players and cadets in the Southern Conference of Division I basketball. Coach Driesell is currently the Head Coach at the prestigious Maret School in Washington, DC. His experience in coaching and developing talent at the college level will be an asset to any young player that plays under him. This site was developed by Amananet Inc. Copyright 2019 Chuck Driesell Basketball Academy. All Rights Reserved.